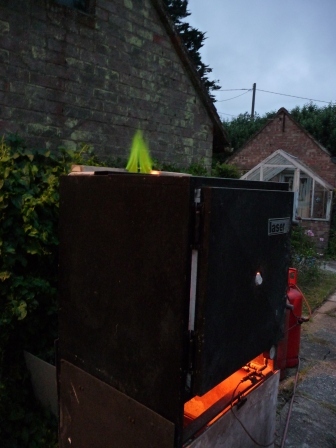 Errmm….Hi Al, have you got an angle grinder? 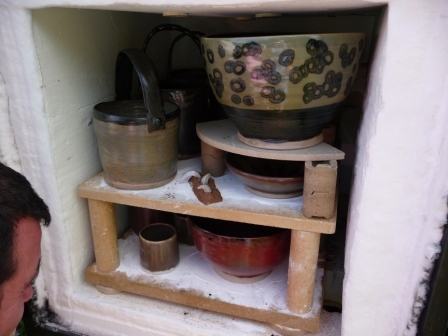 Luckily he did, since all but two pots in yesterdays firing had welded themselves to the kiln shelves. 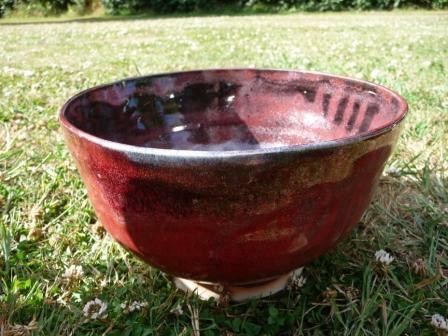 For some reason (this is a glaze I have used before and it didn’t happen last time!) 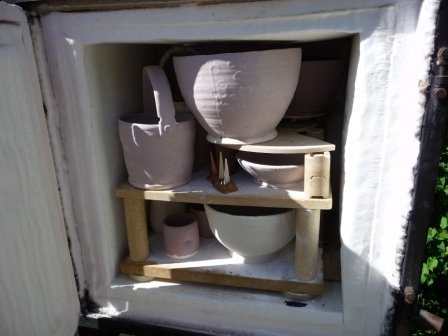 the glaze ran off the pots during the firing and when I opened the kiln this morning, they were certainly not for budging. After a severe beating with a wooden stick, some came free willingly, others came free leaving large chunks of the foot-ring still stuck to the shelf and one poor soul is not going anywhere…he is now part of the shelf…no amount of beating or grinding is going to set him free. 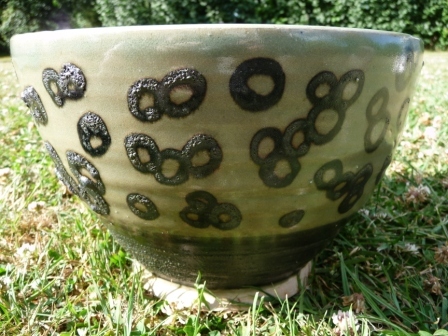 By some twist of fate, the only pot in the kiln that mattered came out unstuck and unscathed. 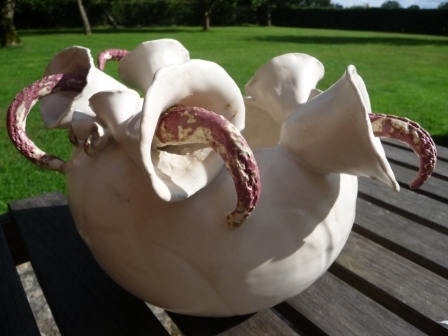 A lily bowl commission for a friend’s wedding gift, I don’t actually know the bride Janet…..but I feel like I do…..so I very much hope she likes it…when she finally get’s it. 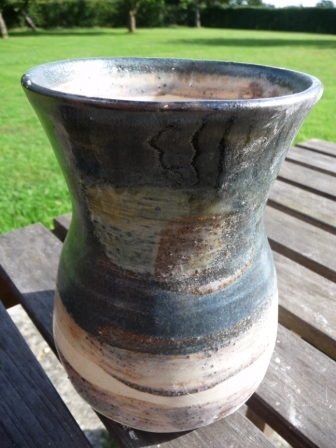 Am pleased with the results of some of the slips, especially the Maryport slag. 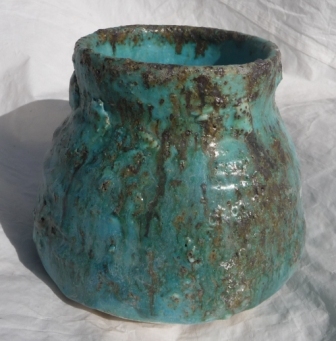 This may need a second firing, but the iron in the slag has done magical things with the turquoise glaze. 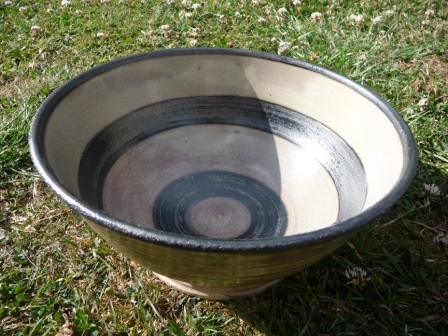 The crater glaze is amazing…..love it….will be brilliant over black slip. 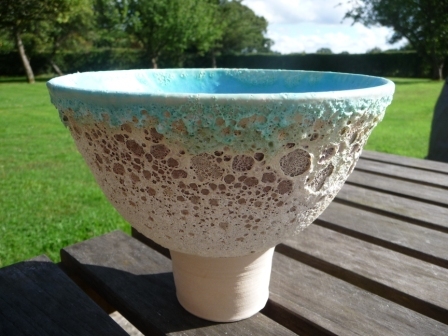 I have been carrying the bowl around with me all day….I can’t believe it, something that came out of the kiln like it was supposed to…in fact much better than I had thought….may even tuck it under my pillow tonight…or is that taking things a bit too far? "Help....I'm Stuck!!"...... "humm..you ain't going nowhere!" That's it....get to work on my bottom with the angle grinder...gently now! 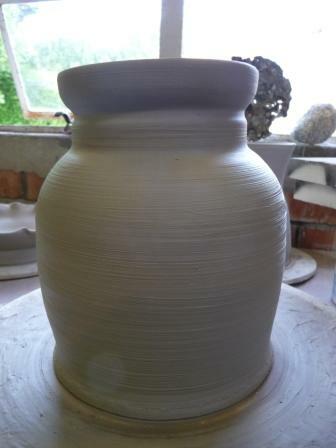 Have tried throwing with the reclaimed clay from the pugmill and have decided it is far to soft. 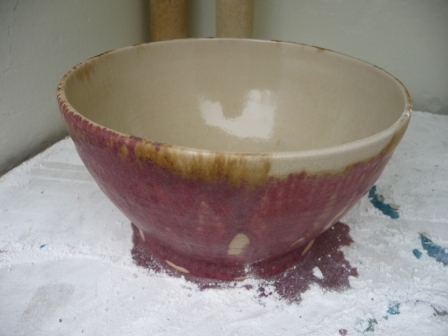 I just got to the point of making a nice large bowl and then the whole thing collapsed….more than a few times. On the plus side, I now have some nice large plates! 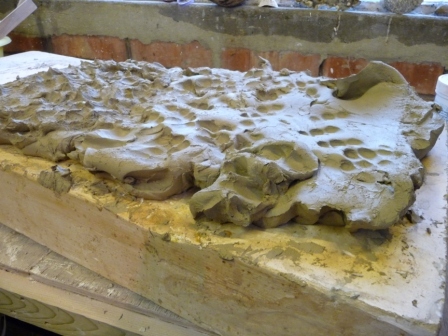 I am going to leave it on the plaster bat overnight and see if I can wedge it into something more useable tomorrow. 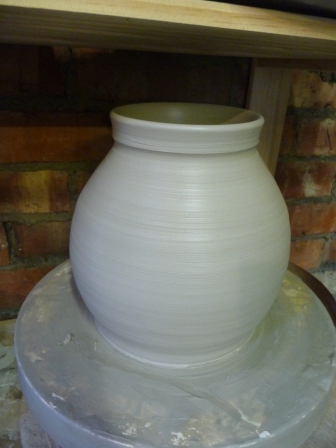 I did manage to throw my largest (and tallest ever) 2 component vase today though…with the reclaimed clay left on the plaster bat all day yesterday, so I am hoping for even better productivity tomorrow when I have more clay to play with. 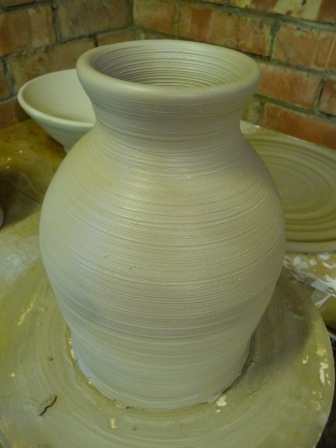 Vase...something is wrong...this looks like it might be useful!! 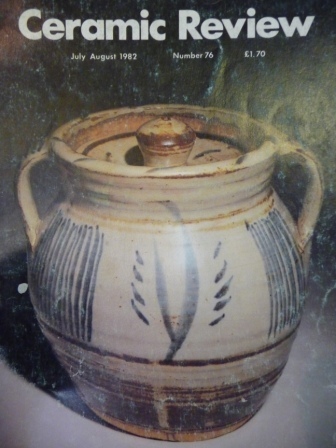 I thought I would try and reproduce the principles of a storage jar by Michael Cardew featured on the front cover of Ceramic Review in 1982. 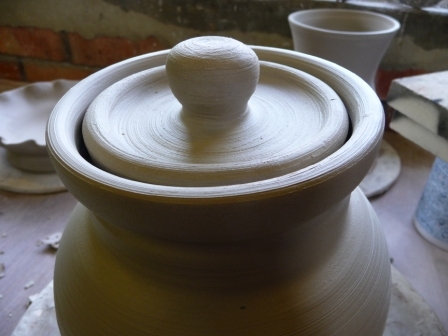 It is thrown in three parts: 1. the main body (allow to dry for a while….or use blow torch! ), 2. throw the neck as a separate component. Put the main body back on the wheel and attach the neck. 3. the lid. I surprised myself by how relatively simple it was to do….and more amazingly the lid fits. I just need to attach some handles now. 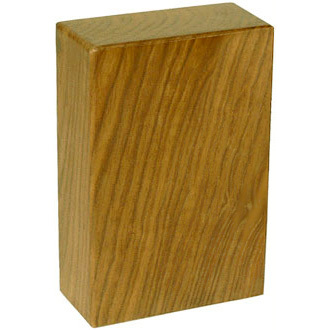 Admitedly the shape isn’t quite the same, his has a more rounded body, but the elements are there. This is a definite throwing breakthrough. 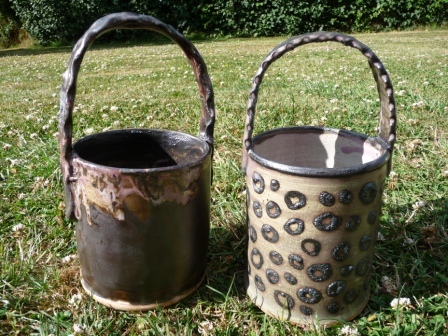 Some of these pots might even be useful! One of the butchers at the farm shop asked me if I would make him a tagine. 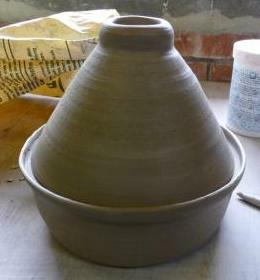 Then there was Jamie Oliver’s TV programme from Marrakesh that focused heavily on cooking with Tagines (although not the ones with fluted lids)….so have been meaning to have a go at making one for a while. 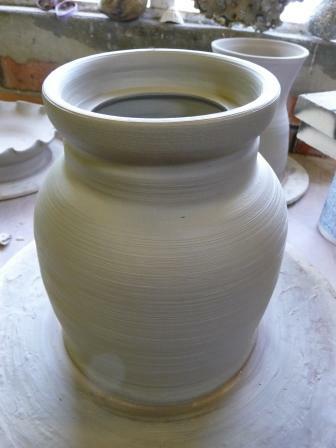 Now I seem to be getting somewhere with the throwing, there is no time like the present. On the design front, the cone shaped cover is supposed to act like an oven and the entire lid is totally sealed to retain heat and moisture. The aim is not only to prevent it from drying out during the long cooking process, but also allows the slow infusion of flavours throughout the dish. The lid has an extended knob at the top which is designed to remain cooler and thereby act as a handle. 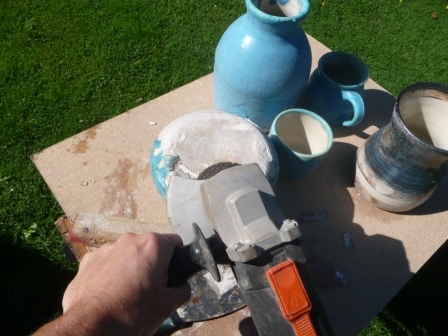 Originally it would have been made from earthenware, but I used grogged stoneware….because that is what I had to hand. I think the rim of the cooking pot could have been thicker and maybe the whole think could have been wider or maybe the lid should be shallower with a smaller knob. Not bad for first attempt though, at least the lid fits on. 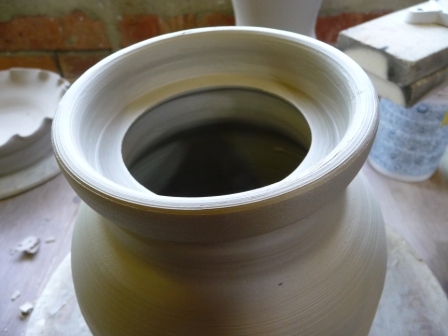 Am getting some mileage out of my new galleried rim technique….how did I manage without it?! 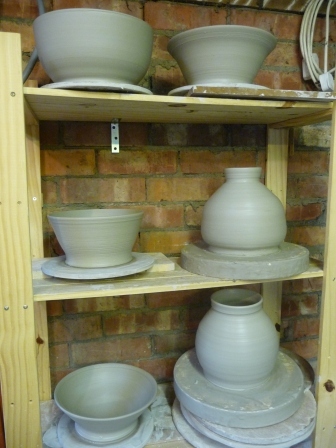 Probably the most pleasing firing to date, but still some dodgy looking glazes. Not sure if they are failing to flourish because of the firing, which seemed to be spot on this time, or because of the preparation. I followed the recipe to the letter, so can only assume it is the firing, or the application. It’s all so unpredicatable. 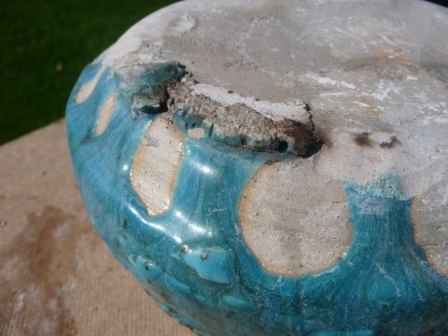 That’s why when you do get a lovely piece like the large celedon bowl it is so rewarding. 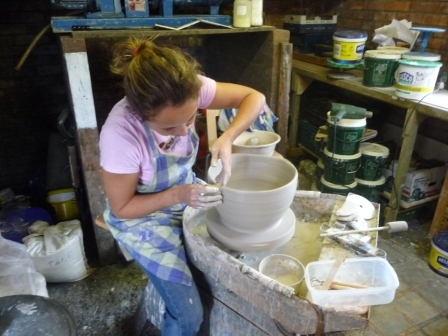 Have another shed full of large bowls, so we keep practicing…..one day we will get a glaze that we love……. Cones - perfectly fired. Learnt good technique...place the cones diagonally.....then you can see them all through spy hole....doh! The Opening. It takes a while for what you are presented with to sink in.....is it any good???? Buckets. The glaze on the one on the left was called 'white brain crawl'....I like it, but totally the opposite of what expected. 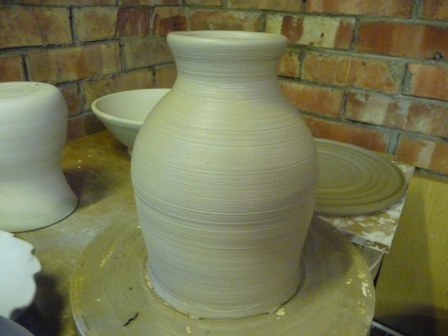 Didn't check it was suitable for reduction firing. 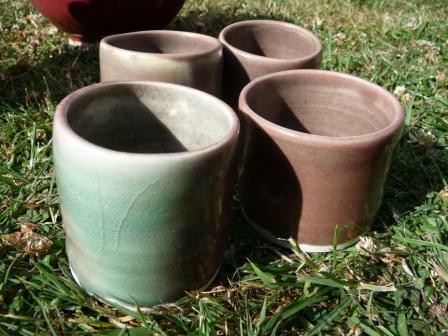 Supposed to be pale Celedon glaze on porcelain beakers. 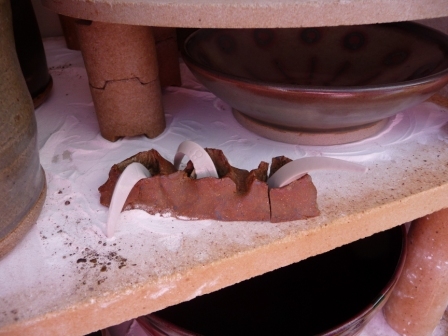 It has worked on the front left one which was close to the burner in the kiln, which makes me think the others are under fired. Will take them to Farnham and refire.